There are over 2,000 versions of this story, some of them pre-date the Bible. Something about it strikes chords within our psyche. Perhaps it’s because it’s a story of survival. Perhaps it’s the promise of reward in the ‘happy ever after’. Either way, we never seem to tire of it and at this time of year, it’s ripe for another retelling. Playwright Mike Kenny takes the fresh approach of having his version told and enacted by a pack of rats in the kitchen in which Cinderella suffers so much of her grief at the loss of her parents and bullying at the hands of her stepsisters. The rats narrate, sing, and play instruments and are an instantly likeable lot in their ragged costumes. Their rodent nature comes from movements rather than appearance – they could be any of society’s outcasts. The script is both funny and poetic, meeting our expectations of the well-known plot while giving a new slant, a rat’s-eye view. The original songs by Ivan Stott are irresistibly catchy, adding to the humour: there’s a nod to Disney’s Ev’rybody Wants To Be A Cat with Nobody Wants To Be A Rat but it’s not all jolly japery. There is a kind of sweet melancholy to some of the songs. Cinderella (Esme Sears) has a plaintive number that almost breaks your heart. Beautifully sung. Sears is the only black cast member, the skivvy, the victim of oppression – this adds another resonance to the piece that is perhaps unintended. Your heart goes out to her and we see the long-term effects of bullying: the rock-bottom self-esteem and lack of self-worth. It’s no wonder this Cinders feels an affinity with vermin. 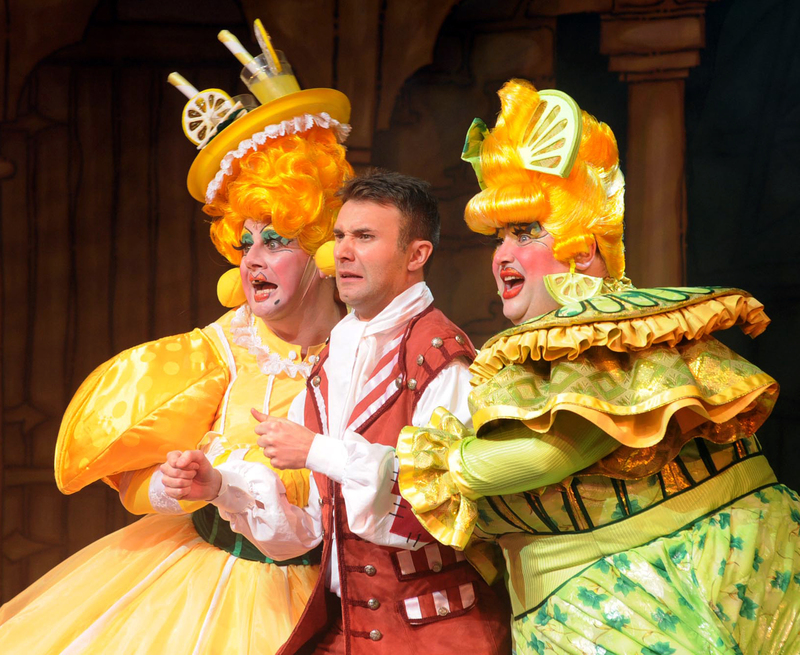 Stephanie Rutherford and Chris Lindon are the ugly stepsisters, This Un and That Un – it’s their appalling conduct that makes them undesirable – and, of course, a lot of fun. Jake Waring is appealing as a gauche, socially awkward Prince. Tim Heywood’s costumes are bright and colourful, with a hint of the dressing-up box to them, while Nettie Scriven’s set, with its illuminated washing lines, has a picture book quality. Sarah Brigham’s direction gets the tone spot on throughout. The dynamics and energy levels are handled masterfully – we are reminded it’s only a story but we are drawn right in and made to care. This is a Cinderella that plays on our imaginations through storytelling rather than spectacle, using the transformative power of narrative theatre instead of special effects to work its magic. It’s a lovely, funny, charming, touching and satisfying production that transfixes and delights children and adults alike. 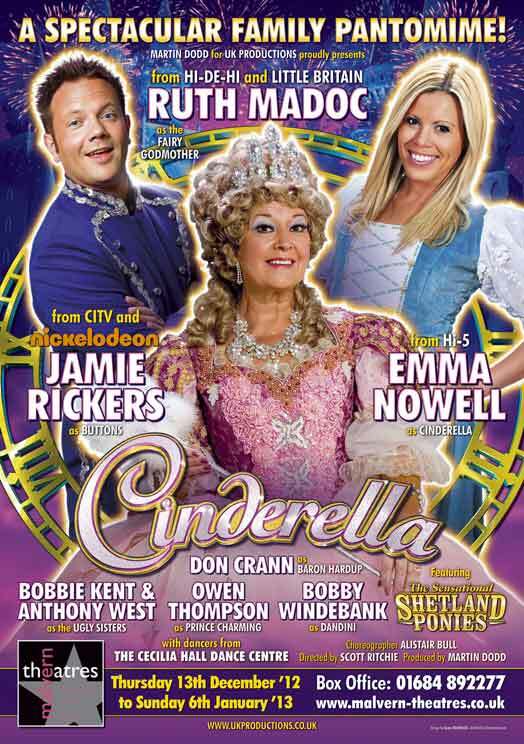 The Grand’s pantomime this year is the classic Cinderella and I have to say it’s perfect. Julian Clary heads the cast, so to speak, not in the title role but as the Prince’s right hand man, Dandini in a series of evermore elaborate outfits. Clary’s act is a good fit for panto: the relentless innuendo (he slips one in every other minute, they come thick and fast, etc…) and the mocking of the grown-ups in the audience – these have been panto staples for centuries. But here’s what’s magic about this production: no single element or personality is allowed to dominate. This is not merely a vehicle for Clary to sell his hilarious wares. Everything blends to create a perfect piece of entertainment – I’ve used the P word twice now and will do again before this review is over. There is spectacle and special effects, singing and dancing and slapstick – everything you’d expect, and it all works in concert to dazzling and highly entertaining effect. Niki Evans, flying in on a crescent moon, as the Fairy Godmother is clearly in her element. She is afforded opportunities to show off her belter of a pop-star voice and practically twinkles with panto charm. Her native Black Country accent adds comedy and bathos to some of her more outlandish declamations. Absolutely delightful. Joe Tracini (latterly ‘Dennis’ off of Hollyoaks) is an irrepressible and lovable Buttons, demonstrating an impressive range of skills from slapstick to magic tricks to singing… The man is a great ball of showbiz and thoroughly endearing. His knockabout japes are the perfect (there I go again) foil for Clary’s sniper-like sarcasm and double entendres. Ben Stock and Tony Jackson are the Ugly Sisters – a wickedly funny, bitchy pair of drag queens and – here’s the test of the Ugly Sisters – they play the invitation-tearing scene with exquisite evil. Their bullying elicits genuine gasps from the kiddies in the audience, and is all the more effective thanks to a charming and vivacious portrayal of Cinderella herself by Alice Barker. Iain Stuart Robertson is an affable Baron Hardup, and Ian Gledhill’s Lord Chamberlain shows what can be achieved by a strong character actor in a minor role. With a chorus of dancers, a troupe of babes and a small but hardworking band (under the musical direction of David Lane), energy fills the auditorium. I had such a good time. In all honesty, I can’t fault the production. If you’re looking for traditional fare for your seasonal entertainment , you won’t go wrong with this one. The ‘name’ in this year’s Malvern panto is Hi-de-Hi star Ruth Madoc, appearing in a puff of smoke as the Fairy Godmother. Without a baddie to banter with, she has to open the show on her own, acting as a warm-up. Madoc’s commanding voice and pleasant manner set the tone for this energetic and irresistible production that has more in the way of stimuius/response than B F Skinner’s entire career. The brief appearance of her yellow coat and xylophone got a warm reception from the older members of the audience, me included. Emma Nowell’s Cinderella is a spirited, good-hearted lass and even though her stepsisters still wipe the floor with her, she presents a likeable character and not just a cipher. Her singing voice is particularly strong. Jamie Rickers as Buttons is relentless in his pursuit of audience participation. His entrance, complete with a tumble into the orchestra pit, is hilarious. He is a very physical, knockabout performer and handles the traditional patter extremely well. Some of the pop culture references could do with updating. We don’t really need Little Britain catchphrases, do we? The ugly sisters, Bobbie Kent and Anthony West, have an impressive range of ridiculous outfits that accentuate the height difference between the two. Their sardonic, deadpan bitchiness is hilarious – their evil natures bubbling over in a flash. The handling of Prince Charming and Dandini was a breath of fresh air. These scenes can be tepid but this pairing (Owen Thompson and Bobby Windebank) given funny lines and a tendency to break out into the ubiquitous ‘Gangnam Style’ at any random moment, really liven up the show. They do a lovely swing version of ‘Me and My Shadow’ in contrast to the pop songs and ballads that dominate the rest of the score. The production oozes tradition – there is a “It’s Behind You” scene with a ghost for no apparent reason other than it’s such fun. The transformation scene is old school but effective. I don’t like to see live animals being used for entertainment purposes; the real live Shetland ponies that appeared to pull the coach gave me the only moment of discomfort of the evening. Director Scott Ritchie pushes all the right buttons, so to speak. I particularly enjoyed a silent movie sequence to depict a thwarted fox hunt, and the way the relationship between Cinders and the Prince is not taken seriously – until it matters. Their duet (from High School Musical 3, I believe) at the ball is perfectly romantic and beautifully sung; you really don’t want the clock to strike midnight and interrupt them. Alastair Bull’s choreography is superb. The second act opener, “Vogue”, is stunning. The energetic dancing villagers (Simon Bolland, Katie Hale, Ellie Keene, Dylan Mason, Jasmine Sheringham, and Isla Thomson) are a tight ensemble. There is something quirky and essentially pantomimic about seeing contemporary choreography and moves being busted in those fairytale costumes. All in all, the show is a delight and as camp as Christmas, delivered by skilled performers who can expertly handle the form. Head for the (Malvern) hills and have yourself a ball.